For the price of the Iraq War, we could fund the Lizard People's Senate campaigns for the next thousand years. The Minnesota Senate race was the most expensive race of this year, with the candidates together spending $32.3 million. 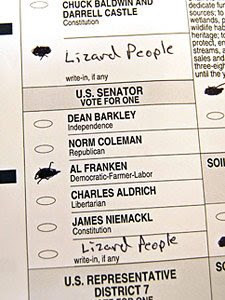 On one of the challenged ballots that has come to light in the recount, a voter had written in 'Lizard People' for several offices including the Senate. Assuming that half the total Minnesota expenditures are sufficient to make a candidate competitive, we would need to spend $16.15 million every six years to fund one of the Lizard People's campaigns for each seat. At that rate, we could fund the Lizard People's campaigns for each seat for ten thousand years at a cost of $2.69 trillion, which is $310 billion less than Joseph Stiglitz and Linda Bilmes' estimate of $3 trillion for the total cost of the Iraq War. Thanks to Stentor Danielson for sending in this suggestion, and Blar for a correction. Back when I started this blog in 2008, the Iraq War had been estimated to cost $3 trillion by two top economists. That's enough to buy a new Toyota Prius for every household in America -- hence the name. For four months, I listed a new thing you could buy for the price of the Iraq War each day. I'm a philosophy professor at the National University of Singapore. If you want to know a little more about me, you can check out this interview that has my views on lots of fun philosophical topics. Or if you want to see my homepage, it's here. I also have a self-titled blog where I post occasional political and philosophical content -- mostly stuff that my friends on Facebook found interesting. If you're interested in other random stuff by me on the internet, here's my most-read philosophy paper, "Possible Girls." It's about how you can have a romantic relationship with someone in another universe. It's been covered in Valentine's Day special posts on Vox and the Washington Post. Prius+family image used under a Creative Commons license from fajalar.